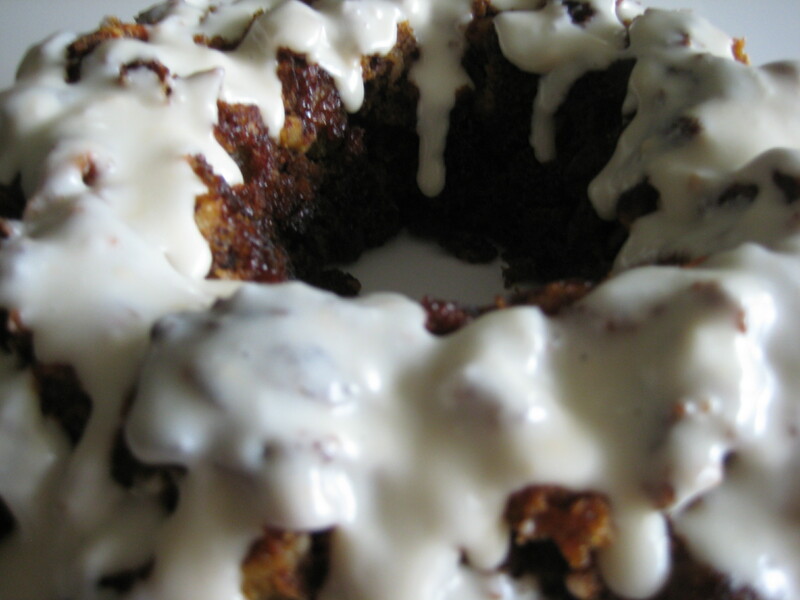 Carrot Bundt Cake with Vanilla Glaze – Voila! This was almost a disaster. Today I had a craving for baking and carrot cake. James is not a huge fan of carrot cake (“Why would you want vegetables in your dessert? !”) – so I’ve refrained from baking one of my favorite desserts. But since I had a craving and we’re heading home to Raleigh for the weekend to see the folks, I figured I could share the wealth with them. So! Back to the almost-disaster-carrot-cake. I put in all the ingredients and when I mixed it all together it looked like there were too many raisins, walnuts and carrots and hardly any “free batter.” There was no room it seemed to just enjoy the cake part! At the end, when I turned the bundt pan over to see how it all turned out, the top quarter or so stuck to the pan….but it was all raisins! So in a Darwinian twist of fate, the raisins that weren’t supposed to be part of the cake gene pool, removed themselves on their own! Preheat oven to 350; butter and flour bundt pan. 1. Mix flour, baking soda and spices together in small bowl. 2. Mix eggs, butter, orange juice, vanilla extract together in larger bowl. Stir in dry ingredients. Add walnuts and mix. Add raisins and mix. Finally, add shredded carrots and mix. You should see a nice ratio between all three additions. 3. Pour into bundt pan and bake for 35-45 minutes, or until it comes out clean. Let the cake completely cool. 4. While the cake is cooling, it’s time to make the glaze! Note: Homemade icing is the easiest process…ever. 5. Mix together the three ingredients in a bowl with a spoon. Stir until combined well and has a very smooth texture. 6. Once the cake it cool, drizzle on the icing. Note 2: What’s nice about the ease of the glaze is if you run out while drizzling it over the cake, you can quickly make a new batch! Voila! you’re done and it’s time to enjoy! Post-baking ideas: I would be interested in adding crushed pineapple or substitute the walnuts for minced granny smith apples. What additions would you add? Next Post Cooking with Friends! Pingback: Hush Puppies « Voila!